Finding the story and searching for a subtext; the accessibility of Contemporary Dance as a modern medium. A brief look at my latest article. Information and the meaning of information is paramount in todays society. Whether it is the constant need for information, social networking, rolling news channels or instant messaging, the modern person thrives on information. With this comes the need to define what that information is, what the story behind the information is, be it a personal derivative or a story based on fact. Contemporary dance is a medium that has weathered many storms. The changing politics of the body, the sexual revolution, the feminist movement and the introduction of new media to choreography. It has changed and revolutionised itself so much that if Isadora Duncan met Jiri Kylian, one wonders what exactly the two would have to talk about. Both choreographers of the modern form, yet they serve as a perfect example of the way in which the contemporary form, and the way it is choreographed, has changed in less than one hundred years. As a working artist, it is clear to me that the medium of dance and its contemporary platform are at a cross roads. The wider general public access dance through televised talent contests, celebrity ball room competitions and other such main stream media. 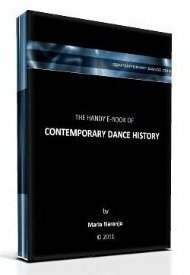 Thus they perceive contemporary dance as a narrative tool, which is a viable medium of the contemporary dance genre, but it does not perpetrate or show the most innovative and cutting edge dance that is being created on a daily basis. These audiences don’t translate to the contemporary art environment where dance is experimental, risky and, dare I say it? More exciting than a story being told through watered down contemporary vocabulary. Contemporary art practice seems to have a niche audience which consists of other contemporary artists, their families and friends often showing a blind interest in their practice. The artist population is wide and varied, it is saturated to a point where there are so many artists vying for the first position, to achieve the most success. While there is room for everyone to practice their art, their passion, it can be daunting to have so much noise to over come. Does this impact on the nature of their art? The struggle is getting the wider public interested in what is going on within the contemporary art world, the exiting and innovative practice that is moving contemporary art forward. But why is that so? Why is it that contemporary art is still something outside of the mainstream? Why is the market and the accessibility of contemporary dance so niche? Could it be suggested that to make contemporary dance in its most modern and innovative form more accessible, the medium involve more accessible tools such as a story, a meaning or a stimulus? As an artist, I want my work to be seen by as many people as possible, I would like the work to considered as something this is modern, progressive and interesting. But in doing this, a degree of control is lost which renders the work diluted and would not represent the true rationale of the work. So what would be the point of making work if this were the case?